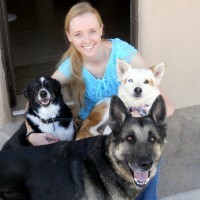 Dr. Lesley Gonzales graduated from Colorado State University College of Veterinary Medicine after attending New Mexico Institute of Mining and Technology in Socorro for her undergraduate studies. While she grew up in several states including Colorado and Alaska, Dr. Gonzales fell in love with New Mexico after attending NMT where she met her husband, a local rancher. Dr. Gonzales is particularly focused on all aspects of surgery as well as the challenging internal medicine cases. She is a member of the American Association of Feline Practitioners but loves taking care of all patients coming into the hospital including rabbits, ferrets, and the occasional goat. She enjoys getting to know the people bringing in their critters and strives to provide personalized, quality veterinary care for each and every animal she meets. she enjoys spending time with her husband and pets, catching up on sleep, reading, and hiking.